The second book in The Cat That Series follows the same feline hero as in The Cat That Made Nothing Something Again, but both books can be read independently from one another. Having restored the life-giving moisture to the land, and returned to his life as a house cat, Samuel’s leisurely existence is once again interrupted—this time by a visit from a wolf. With news that a rampant flame threatens to burn down the forest, Samuel travels with his new companion in hopes of stopping the fire before it spreads across the land. 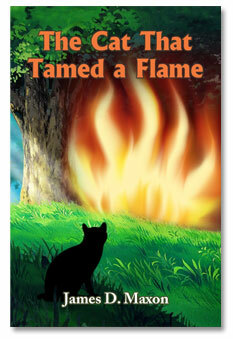 Yet new dangers await our feline hero as the harsh realities of nature put his survival skills to the test. This is a children story / children book written mainly for second graders (2nd graders) or older (ages 7-12 +). It’s a great starter book for early readers, and parents can feel confident in sharing The Cat That Tamed a Flame with their kids. There are no sexual situations, gore, or foul language. Just clean, good old fairy tale fun. And, unlike many Christian books, this one isn’t preachy—it provides subtle messages of faith and hope while reflecting on the Parable of the Prodigal Son.